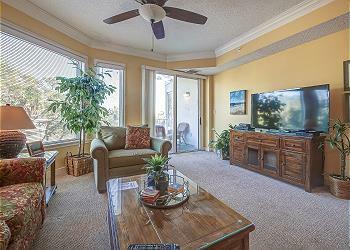 This delightful 1 bedroom, 1.5 bath villa is in building 2 on the fourth floor at the oceanfront SeaCrest Resort. The living area is bright and cheery with premium hardwood floors. The fully-equipped kitchen has a breakfast bar with seating for 2 and a dining area with 4 additional seats. The king bedroom boasts a large walk-in closet and a lovely bathroom with walk-in shower, garden tub, and double vanity. Get a little break on the private balcony. This villa is perfect for small families or couples who need a getaway! The SeaCrest Resort is in the Coligny Beach area of Hilton Head Island with dining, shopping, and entertainment all within walking distance. There are many activities available in the area, but most importantly, the wide, sandy beaches are just at your doorstep.